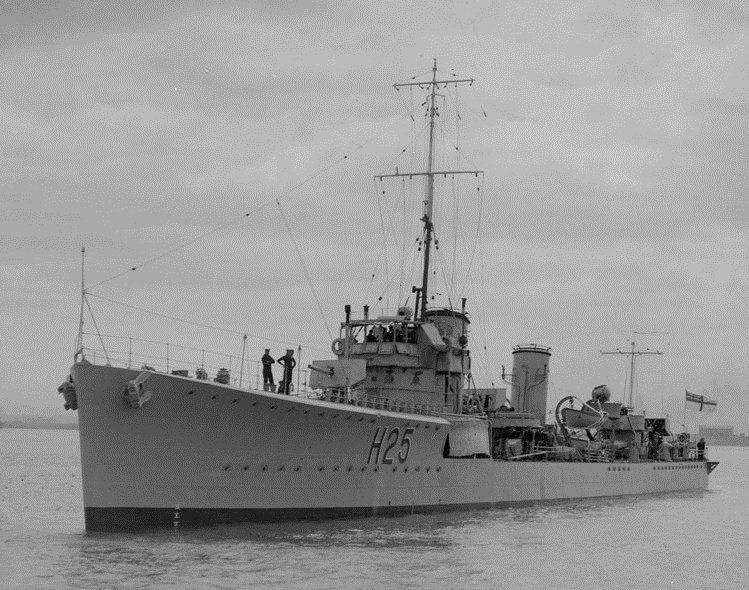 HMAS Tasmania. Photograph from Allan C. Green collection of glass negatives. State Library of Victoria Image H91.108/321. First introduced on the rearmed scout cruiser Foresight in 1913, the Mark IV armed many destroyers and flotilla leaders of World War I. The Mark IV developed a reputation during World War I for repeatedly jamming. The Marks XII, XII* and XXII were an interchangeable series of guns based upon the Mark IV, but specially adapted for "wet mountings" on submarines. The first Mark XII was issued to submarine L33 in October 1919. 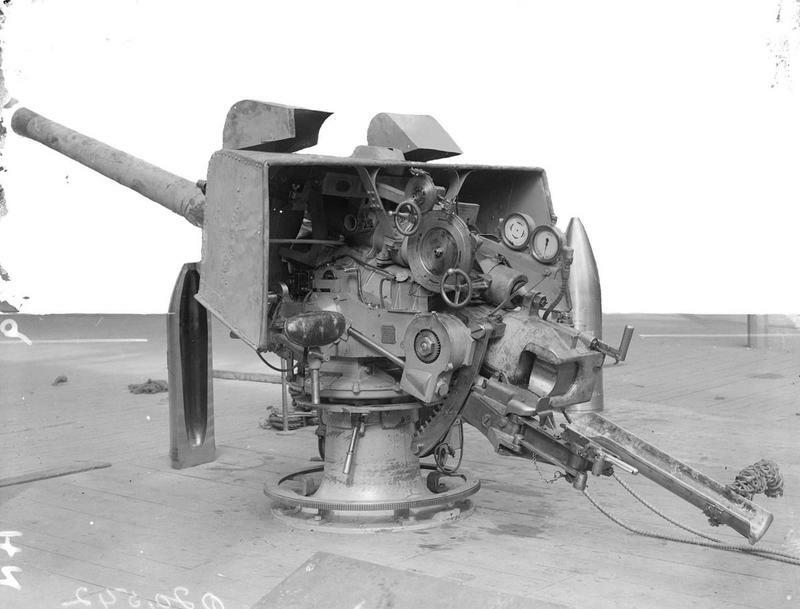 The Army experimented with one Mark IV gun for anti-aircraft use in 1913. In 1938 it was proposed to convert 900 Mark IV guns to HA use but this was never carried out. The Mark IV was constructed of inner A tube, A tube, jacket and breech ring and was partly wire wound. This gun had a horizontal sliding breech block with semi-automatic operation. The Mark IV* had a strengthened breech ring, but this distinction was discontinued after a short time. Mark XII had a tapered inner A tube, A tube, wire for about half the length, jacket over more than half the length and a breech ring. The Mark XII* and Mark XXII had monobloc barrels and had a manually-operated horizontal sliding breech block. The Mark XII* had no muzzle bell and the breech ring was shaped while the Mark XXII had a muzzle bell and a rectangular breech ring. Of the 1,141 Mark IV guns produced, 979 were still in service in 1939. 60 Mark XII, 52 Mark XII* and 46 Mark XXII were also made. 58 of the Mark XII guns were still in service in 1939. A note on sources: Norman Friedman in "Naval Weapons of World War One" lists the submarine Mark XII as a derivative of the Mark V (45 calibers) but all other sources list the Mark XII as a derivative of the Mark IV (40 calibers). ^Outfits included SAP, HE, shrapnel and star shells. ^Submarine outfits included SAP, HE, 10 rounds of HE with RDX/TNT fillings and 10 star shells. ^The heavier projectile was issued to submarines starting in late 1944. ^The sources below differ as to the muzzle velocity and range of these weapons. I have chosen to use those given in "Naval Weapons of World War Two" which are for 3crh shells. A proposal to use these as starshell guns was made during World War II and one experimental Mark XXI HA/LA mounting was built to test the concept. Apparently the results were unsatisfactory as no more were built or planned. ^Some PIX mountings were converted to HA use and used in the "K" class Garland, Paragon, Porpoise, Unity and Victor (one each). ^CPIIIc was a modification to move the gun back in the cradle while the cradle was moved forward in an effort to improve the balance. 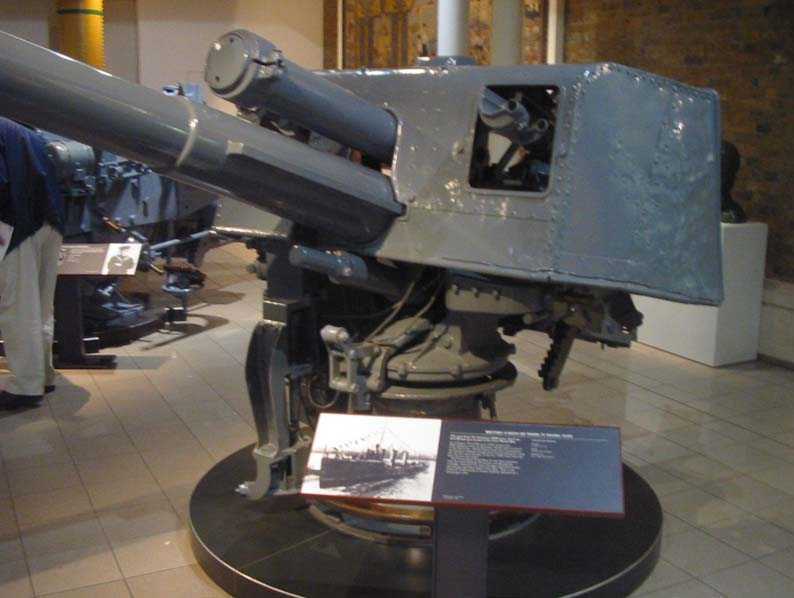 4"/40 (10.2 cm) Mark IV gun at the Imperial War Museum in London, UK. This gun from the destroyer HMS Lance is credited with firing the first British warshot of World War I when HMS Lance and the scout cruiser HMS Amphion sank the German auxiliary minelayer Königin Luise on 5 August 1914. Photograph copyrighted by Vladimir Yakubov. 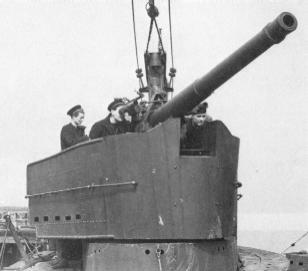 Rear view of 4"/40 (10.2 cm) gun from HMS Lance. Note the cross-sectioned 12" (30.5 cm) Common projectile. IWM Photograph Q 20542. 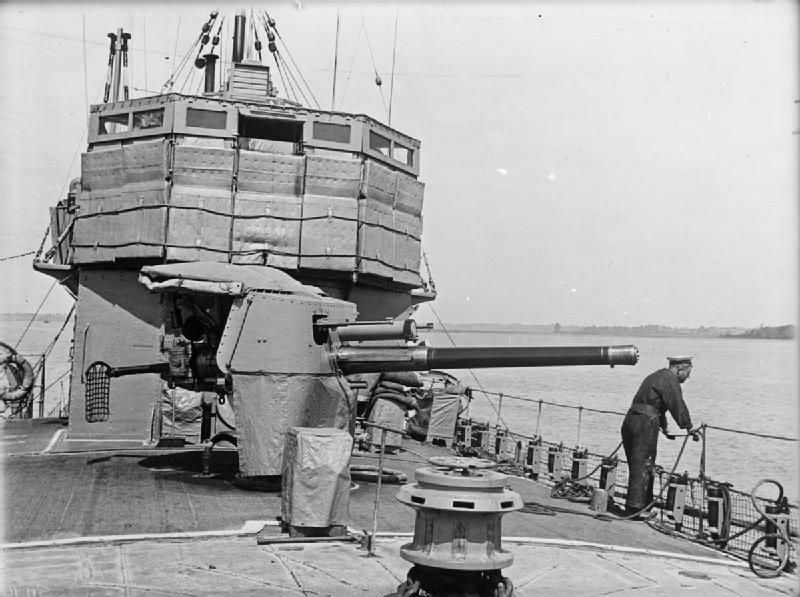 Bow 4"/40 (10.2 cm) gun on HMS Satyr. Note the canvas skirt added to the gunshield as a wind break and the mattresses on the bridge for splinter protection. IWM Photograph SP 1497. HMS Lennox. 4" (10.2 cm) guns are in "A", "Q" and "X" positions. WSS Photograph. HMS Thunderbolt with 4"/40 (10.2 cm) Mark XII in 1941. Photograph copyrighted by John Lambert. 4"/40 (10.2 cm) Mark XII on Submarine L33. 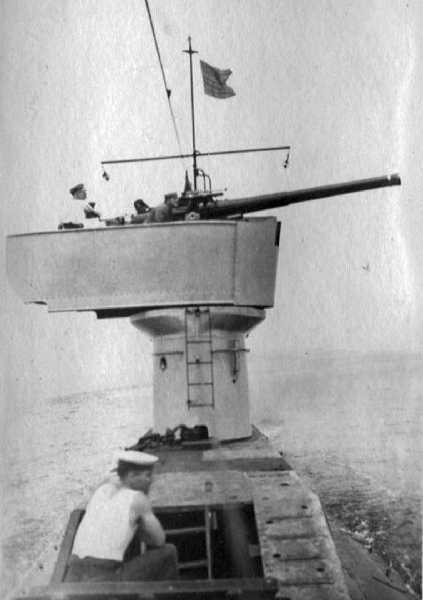 Note how the entire gun platform rotated with the gun, thus ensuring adequate working space. Photograph from the collection of Dave Perkins and used here by his kind permission. "T Class Submarines" article by John Lambert in "Warship Volume III"
Added "A Note on Sources"